Serbia is a landlocked country located in Central/Southeast Europe, formerly a part of the state of Yugoslavia. Over 30% of the country is covered by forest and it also has significant mountainous area. The river Danube also runs through Serbia. Spas, festivals, river cruises and mountain resorts are the main tourist attractions. The country has a rich tradition in art, literature, music and theatre. As an interesting fact, over 1/3 of world’s raspberries are grown in Serbia, who would have known? The Serbian cuisine has been influenced by e.g. Balkan, Mediterranean and Central European cuisines, especially other former Yugoslavian countries and Greece, Turkey, Austria, Hungary. Traditionally it has been very heavy in animal products – meat, dairy, eggs and honey. Especially grilled meat is extremely popular. Besides ratatouille-like sataras, meat-free main dishes are almost non-existent. There are however numerous traditional soups, including vegetarian ones. Pies, salads, fermented foods and pickles are popular, too, but spices are not used much. Bread, which comes in many different kinds, is a very important part of meals. Desserts tend to be rich. This recipe is from the wonderful World Vegan Feast by Bryanna Clark Grogan, made typical Serbian by sauerkraut. The original dish is apparently made with chicken and bacon fat. I’ve never liked sauerkraut, but I figured it would get milder here as it cooked. Well, it really doesn’t, it’s still quite sour (I used sauerkraut in wine, as that was recommended), so not exactly to my tastes. But if are a fan of sauerkraut, you will like this. I wasn’t able to get fresh chilis (and don’t like canned ones), so I used a bit of chili sauce. In a large nonstick pan heat 0.5 tbsp of both oils over medium high heat. Add the seitan and cook until browned, about 5 minutes. Remove from the pan. Add the rest of both oils to the pan with the onions and garlic. Cook over medium heat, stirring, until the onions are translucent. Add the sauerkraut, chilis and black pepper. Mix well. 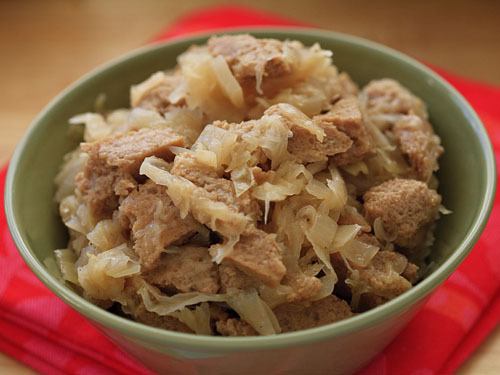 Spread the seitan over the sauerkraut and pour the broth over it. Bring to a boil, then reduce the heat and simmer for 30 minutes. If it looks too dry, add a little more broth or water. Serve hot with e.g. boiled potatoes. Serves 4. This entry was written on February 21st, 2012 by Maija Haavisto and filed under Europe, Other main dishes. Sorry for the late reply, I didn’t get an email notification of this comment for some reason. I don’t see why not! I like some sour things, but it seems plain sauerkraut isn’t one of them. But kimchi is, so I should make it more often.